← You Love doing What? Prior to Christmas I began working on the BlogYinYang Merch Shop. The idea grew out of a need to raise some extra money, as well as a means of exercising my minor artistic muscles. Very quickly the items I began to put together gravitated toward Wing Chun and related images. I suppose I should explain my connection to Wing Chun. Wing Chun is a Chinese martial art. I could go into a litany of its history, but many of its lineage definitions are in question and amount to little more than advertising pitch. One thing is known as fact, however. Bruce Lee studied Wing Chun. A lot of the Wing Chun that Bruce Lee learned translated into the art and science of his own creation, Jeet Kune Do. That is how I came to Wing Chun. In my studies of Jeet Kune Do, I learned about Wing Chun. I find that particular art and science fascinating. It works for me. Perhaps the connection that I have with Wing Chun, through my Si-Fu, Mark Mills, and his Wing Chun Si-Fu (and now also my Si-Fu) Francis Fong comes from Si-Fu Fong’s style. By that I mean, while he is somewhat a Wing Chun traditionalist, he is also very much in Bruce Lee’s vein. Si-Fu Fong has no difficulty innovating, adapting, and modifying when he finds a way better for himself. He opens up Wing Chun to grappling and Kali and other arts, always finding a way to include the Wing Chun principles in seemingly disparate sciences. This also works for me. There are hosts of guiding principles in Wing Chun, though it seems to me that the most major of them is structure, the position you go to and hold. The primary structure requires you to keep your weight back, which is very different from many Japanese arts and sciences, which generally have you distribute your weight, using wide stances. Something about the Wing Chun structure feels right. I am not saying it is the best way or the only way. I’ve studied Okinawan styles and used them effectively. I’ve studied a little Kali and Grappling styles, and used them effectively. But the weight back structure of Wing Chun feels right – for me. I do not get to study Wing Chun as much as I would like. In fact, I have never really taken any formal Wing Chun classes. My training has grown out of my Jeet Kune Do studies, and a large number of seminars and multi-day instructor conferences. But I would enjoy being able to attend a regular Wing Chun class to fine-tune the techniques and principles. Many consider Wing Chun difficult to learn. It requires precise positions. Paradoxically, I find Wing Chun fairly easy to learn for that very reason. It helps having a clearly defined map to fallow. That said, while it may be easy for me to learn, it is difficult to put into application. But everything is difficult to apply at first. Application requires repetition, and more repetition, and still more repetition. It also may be that I find Wing Chun easy to learn because of my prior experiences with JKD and other martial arts. The more you do, the easier it is to find a connection and assimilate another science. Suffice to say, I enjoy Wing Chun. Its guiding principles make sense to me. They fit my frame, as well as my personality. 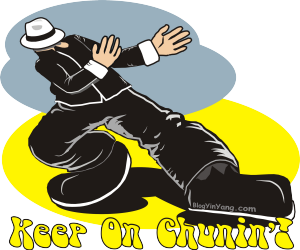 Keep on Chunin’. This entry was posted in Martial Arts, Merch, My Life and tagged Wing Chun. Bookmark the permalink.